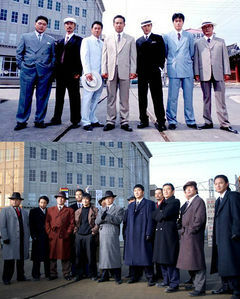 As a fusion drama on the life of politician Kim Doo Han, the drama tells the life of Kim Doo Han with fact and fiction. Kim Doon Han (Ahn Jae Mo, later becoming Kim Young Chul) is the son of the great general Kim Jwah Jin, who fought for Korea against the Japanese during World War II. After his dad dies, Kim Doo Han trains in kung pao and learns to be a leader against the evil Japanese. He finds his own position as boss of the Jong Ro area in Seoul, and vows to protect his own Korean people. Goo Ma Juk (Lee Won Jong), the boss of Seoul, fights against Kim Doo Han in an attempt to hand over the whole Seoul area to the Japanese redevelopment project, pursued by Hyashi (Lee Chang Hoon). Hyashi himself is a Korean but he ironically lives as a Japanese fighting his own people. Through these many barriers, Kim Doo Han struggles to keep the Korean culture alive, later on becoming a politician after the Korean War. This page was last edited on 14 January 2019, at 11:15.